This record has so accumulated so much respect among the “rare groove” crowd that it is no longer particularly rare or known. As the quotes above show, this could be looked at an effort by Donato to “cash in”, so to speak, but with lovely results. Having been approached by the label Blue Thumb to make any kind of record he wanted, he felt encouraged to update his sound and gave him a bunch of cash to go buy new electronic instruments and contemporary albums to contextualize them. The only old tune on here is the first one, ‘The Frog (A Rã)’, which had been a hit for Sergio Mendes and would be recorded quite a few other times (including by Gal Costa on an album he arranged for her, ‘Gal Canta’). The rest of the material is written for the session. Also unique is that he wanted to have “two of everything” — drummers, guitarists, bassists… The two-bass idea didn’t work out, however. 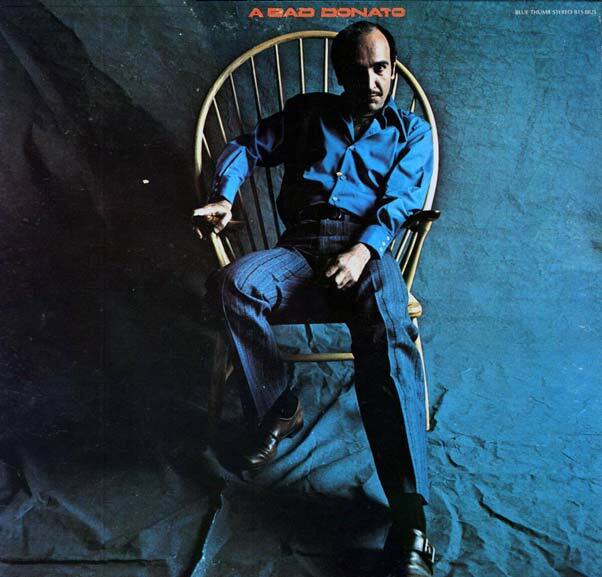 Donato chose to use a bunch of musicians from Stan Kenton’s orchestra, in particular Bud Shank who had helped João out considerably after his move to the United States, along with Brazilian luminarias like Dom Um and Oscar Castro Neves. They brought Eumir Deodato in after the sessions had already begun, and João is right to point out that this collaboration precedes ‘Thus Sprach Zarathrustra’ by two years but basically sets the blueprint for it. And the closer you look and listen, the more it is obvious that this album is not at all about ‘cashing in’, as much as jazz purists would have called this album a sell-out. Donato was taking his cues from what interested him in contemporary music while dealing with the perpetual musical wanderlust he has always demonstrated. When he was not collaborating with some of the most significant figures of musical hybridities in the second half of the twentieth century (Cal Tjader, Mongo Santamaria, Eddie Palmieri and Dizzy Gillespie for starters) Donato was constantly pioneering trends and then abandoning them for new pastures while others made them into successful and lucrative genres. From when he essentially invented bossa nova on the accordian (inspiring João Gilberto), inaugurated bossa-jazz combos, or making one of the adventurous early jazz-funk-rock/fusion albums in ‘A Bad Donato’, he was always one step ahead of just about everyone. And in all this electric career his playing and arranging style has always been inimitably his own and warmly recognizable. Every track on this album is intense even when offset by sunny jazz-pop sensibilities. The two-drummer approach lends an almost ominous quality to certain moments much like double-tracked drums can achieve. Personally I would like to have heard what some these tunes sounded like with only one drummer (Dom Um Romão, principally) just to hear the difference, as sometimes I wonder if its a touch ‘too much’ having two — although, as is the case with many a classic album, I don’t really think I would want it any other way. Not much point in picking highlights since this short record is a winner from start to finish, but lately I have been particularly fond of ‘Celestial Showers’, the appropriately-titled ‘A Lunar Tune’, and the percussion-heavy ‘Debutante’s Ball’. It is nice that the reissue CD prompted João Donato to write new liner notes reflecting back on this album which. It is a drag that they couldn’t find some outtakes or bonus tracks from the session, however — since the original album clocks in at a mere 28 minutes of music. This is the first official release of the album on CD. Tagged Bud Shank, Eumir Deodato, João Donato, Oscar Castro Neves. Just for listener feedback, I play "Quem é Quem" way more then this set. When I want to hear Donato at his very best, this is not the recording that I reach for. This one just doesn't click for me. I find it forced. Perhaps a bit too Americanized for my tastes. Donato seems much more at home and in his element on "Quem é Quem". That's my take. oi JT, just for the record, I never said this was Donato at his "best". As far as Donato in his `element` I would agree 'Quem é Quem` is rightly considered a superior work from this period. (Incidentally it was also the first album he made after returning to Brasil). But I still like `A Bad Donato` on its own terms. I know that for quite a few people it plays like an equivalent of "Electric Mud" but that doesn't bother me. I tend to reach for other sets by Donato, like "Bossa Nova Carnival" or "Bud Shank & His Brazilian Friends" before I put this on, but that's me. Sometimes though there are better pressings of discs, so I will be sure to give this pressing a listen to see if it sounds better then the issue that I have. Hello, FB! Would you be willing to re-up the FLAC file? I'd appreciate it if you did, and I'll completely understand if you tell me you won't, there are absolutely no worries. Loved Von's A Misteriosa Luta. I'll choose a bad needle drop over a poorly remastered CD version of a record any day. This needs a crucial re-post. Thnaks a BUNCH for your work. Thank you for re-posting this. I'm not familiar with it but I'm looking forward to finding out. A request; please consider reactivating the Flabbergasted Folk blog. It's unusual and good in the same way that this blog is. Thanks,"Anonymous." I have considered just folding in my folk music interests into this blog. I barely have time to maintain one blog, let alone two. But maybe I will revive F.Folk. Thanks. I missed this one the first time around. Thanks for the detailed review. I only stumbled upon this record recently and was thrilled to have found in fact something of an early “fusion Deodato” record, a period which I consider his personal prime (until about 1975). I personally think Deodato’s later work lacks the depth and natural sound, a certain gritty rare groove charme of this and especially from 1980 onwards his stuff may be perfect, slick pop for radio and clubs but is ultimately insufferably shallow. “A Bad Donato” reminds me very much of Jose Briamonte’s “Briamonte Orchestra” of the same year. A similar concoction of Brazilian, Jazz, and Funk influences. P.S. They shouldn’t have messed with the original cover. “psychedelic funky experience” ugh.